This book has surprised me. I am a Duesenberg, and not a Ford Model T person. So the 'Model T' of tanks, the Sherman, has never impressed me. I knew it was rugged and dependable, but I also knew it was known as the 'Tommy cooker'. It was a perfect tank up until 1943. In the last two years of the war, its reputation went downhill. The Sherman armor was not up to snuff when playing with the German big cats: Panthers and Tigers. By 1943 the Sherman's short 75mm gun was also not powerful enough. Even with the issues mentioned above, the Sherman did have some good points. It was easy to drive, was fast, and could be repaired quickly. The Sherman was meant to be mass produced, and was it ever. It is the third most produced tank in history! (the most produced tank was not the T-34, but the t-54/55 if you include all of the Chinese models of it). The book starts with short history of the Sherman, and then goes into its use in British armored formations. This then segues into a history of each British armored division or brigade in the Normandy campaign. Then the book has twelve colored pages of front and side pictures of all different types and models of Shermans', including the model V with the 17 pounder gun. The author believes that the term 'Firefly' for this version was not used in WWII. These pictures are excellent material for all of us model builders. We get into the model section next. There are six different models showcased from world class model builders. The two that stick out to me are the Sherman Crab (this had a revolving bar with heavy chains attached to set off mines), and the BARV(Beach Armored recovery Vehicle). I am a sucker for armor oddities or tanks that had very low production figures. The BARV is soon to be available from ROCHM Model for both Dragon and Tasca kits. Next in line is a rundown of all of the different kits in the 1/35 and 1/48 scale. The pages right after this are for all of the metal and resin add-ons that you can buy to trick out your next Sherman kit. 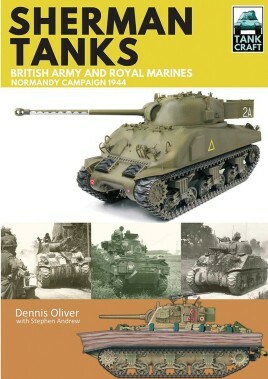 The book ends with a few more pages of background on the different Sherman production models and some more history. This book, along with the one on Tigers I-II that I just reviewed, are great books for someone who wants a short history of these tanks that are filled with facts and pictures of them. Their obvious audience are modellers. For this group the books are of tremendous value.